We cooperate with our customers under contract and often send invoices to them. We have an A4-sized sales invoice image that I want to overlay with a text file to produce a finalized invoice I can send to a customer. The background PDF template stays the same, but we need to make unique text contents for each order. It would be good if we could specify a merge PDF with TXT task for each folder – so we could send text invoices to one folder, statements to another, quotes to another, etc. Is it possible to automate this process with FolderMill? FolderMill is able to render your text files and overlay it upon a PDF file. With our application you can merge a text file with a template PDF file as a foreground image. You can make this process automatic on a regular basis. 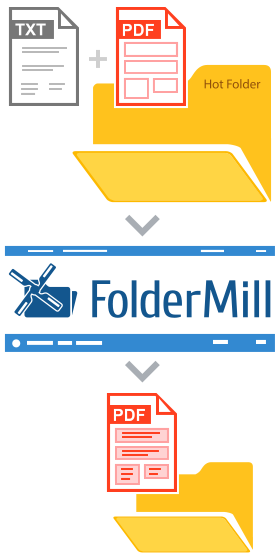 If your sales invoice template is an image file (JPG, PNG, BMP, PSD or any other file type supported by FolderMill), convert it into PDF first: use "Convert to PDF" action in the actions set of a Hot Folder. Extract the .zip file to any folder, e.g. Mark the "Run in hidden mode" checkbox. Run FolderMill by pressing the "Start" button. Now every time you place a new TXT file into this Hot folder’s Incoming folder you will get the output merged PDF+TXT file in the Output (-outdir) folder. If you have any questions or difficulty on using this feature, please feel free to contact us. If this guide doesn’t work for you for some reason, we will find an alternative solution!